Hello everyone, dear users of devices based on iOS. Today, in this short note, I will tell you how to install iTunes on your personal computer. This is done very simply - you do not need a lot of time, much less any special knowledge. So let's start installing iTunes on your Windows or MacOS-based personal computer.. The installation process I will describe on the example of the Windows operating system. In fact, the process of installing the program in Windows is not much different from the installation process in the MacOS operating system, so if you understand the principle of installation in Windows, then by analogy you can install the program in Mac. Go to the site Apple.com. 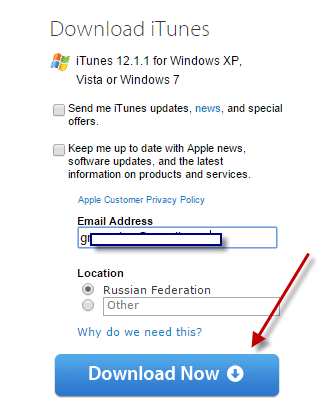 I recommend that you download the program from the official site, there are two reasons for this: the official site always contains the latest version of the program, on a third-party site there is a risk to download not only iTunes itself, but in addition to it a bunch of viruses. So be careful and always watch where you download this or that software from. The download of the iTunes installation file begins. The download speed of the program on your computer depends on the speed of your Internet connection. After the file is uploaded, you need to open it and install. Now you need to do some customization. 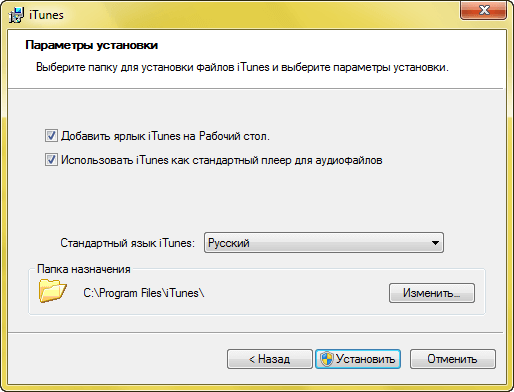 Check the box next to “Add iTunes shortcut to desktop”, below indicate the installation path of the program, this field can be left unchanged. Click the “Install” button. 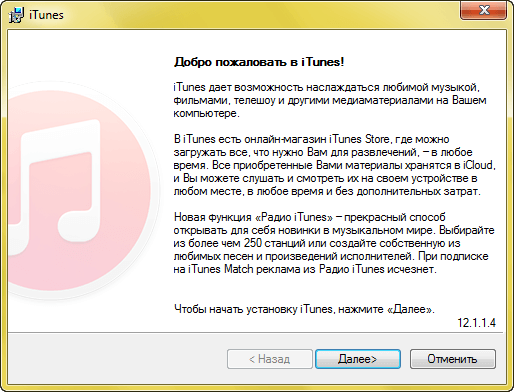 After these simple operations, the process of installing iTunes on your computer will begin..
Today, this is all, I hope you managed to download and install the program onto your computer without any problems. I would be grateful if you share your opinion in the comments to this article. In order to be able to leave comments you must be logged in to the social network Vkontakte. Let me remind you that any program, including iTunes, it is desirable to download only from official sources. Recently, there have been a lot of different websites offering to download certain paid programs onto your personal computer. According to statistics, approximately, 90 percent of such programs are infected with various viruses. Therefore, to protect your personal computer, see where you get this or that program. This also applies to applications that you download to your mobile gadgets. Download only from official sources. Download only from official sources, namely from Google Play and the App Store.